So, I’m kind of an expert on this topic. Wait, that makes me sound like a…..whatever. I don’t spray tan all the time–usually only before special occasions (weddings, vacations, expected run-in with an ex, etc. )–but when I do, it’s with Tiffany at RAW Bronzing Studio. The tans are organic, perfectly airbrushed every time, and won’t leave you smelling funky or looking like a Jersey Shore body double. But if there’s a man (or potential man) in your life, how to get your post-spray freak on is a valid concern. Let’s undress, er, address it. 1. 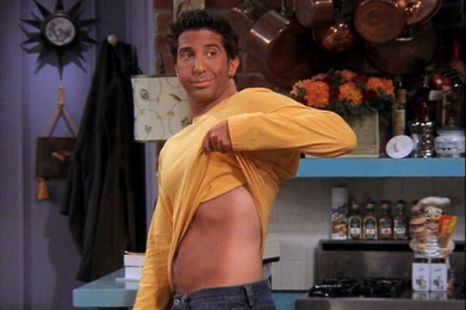 Bumpin’ and grindin’ the same day as your spray tan is not ideal, but let’s be real–sometimes, you don’t have a choice. Wait at least six hours (but eight is better) after your spray session before getting frisky; then do so in a cool temp, and you should get away unscathed. Sweating will mess up your fresh tan, so if you want to roll around in a hot box within the first 12 hours, don’t blame me if you end up looking like this guy. 2. Keep the tonsil hockey relatively tame until after your first shower. If he’s licking your face/neck/wherever, your color may rub off a bit. Also, even with the highest quality tan (ie. RAW), he’ll be able to taste it (albeit, just a smidge) prior to that first rinse. In other words, just keep it on the lips, you freaks. And if he’s extra slobbery, just tell him you’re busy that night (and maybe have him see a health professional about that). 4. Male bodily fluids will take your spray tan right off (whether it’s the first day or the fifth). And that’s all I’m going to say about that. Previous Post Welcome to Witty & Pretty!